If you’ve never been to Disney World before, explaining how vastly huge it is is hard to describe. You cannot walk from park to park, you need transportation of some sort. Then, once inside the parks, it is again overwhelming at how much there is to do and see within each themed park. There are four different parks at Disney: Magic Kingdom, Epcot, Animal Kingdom and Hollywood Studios. Each one with a unique atmosphere and specific signature rides. During this post, I’m going to help you make the most of your day at the Magic Kingdom. 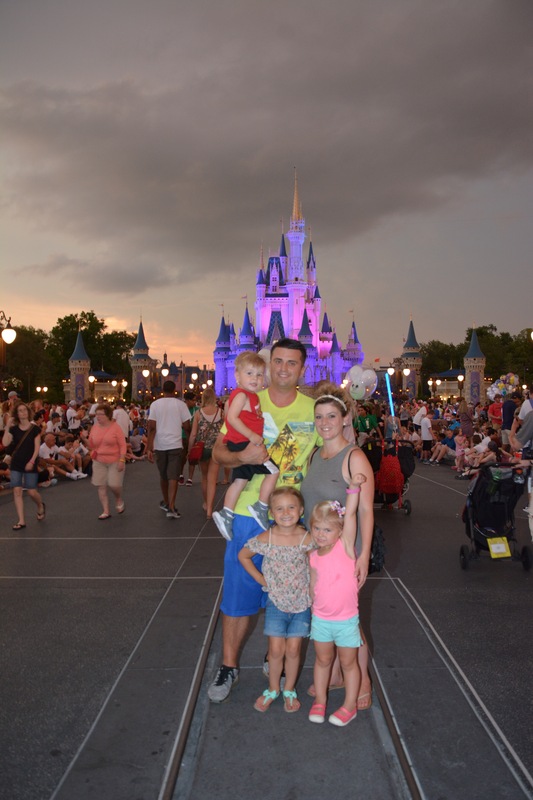 The Magic Kingdom is…well, magical! 💁🏼 It is the park you go to when you want to act like a child again. It is the park where your children will dream of being princesses or swashbuckling pirates and take a ride with some friendly ghosts. It is seeing your kids dance along during parades, brave their first roller coaster and take pictures with their favorite characters. It is Magic. Tip 1: Get there as soon as, if not before, the park opens. No, really. Do not “sleep in because it’s your vacation”. This is a mistake. Go early, do as much as you can and then “go rest because it’s your vacation”. Disney World made some changes in 2017 that you can enter the Magic Kingdom and hour before it opens. Do you want that sweet shot of your family in front of the castle? Duh!? Get there early and you’ll have less crowds surrounding you. Tip 2: Plan your fast passes ahead of time. When I say ahead of time, I really mean 60 days before you leave. That is the first day you are allowed to do it (if you are staying at a Disney Resort… which I highly recommend…but that’s for another post). Booking early will allow you to be more “picky” with the times. Now, choosing your fast passes can be tricky because it really just depends on what you are wanting to do. I am a weirdo and look up wait times all the time and I can tell you the rides consistently with the highest wait times are: Peter Pan’s flight, Seven Dwarves Mine Train and Splash Mountain. I am not sure why Peter Pan’s flight is so long… probably because of the nostalgia behind it, but… it’s always the highest wait time with the new roller coaster Seven Dwarves Mine Train. If you have little kids, this might change what you choose as well. The line to meet the princesses are also quite long. So you may opt to do that instead. To summarize, get fast passes for the rides with long waits or rides you MUST see. Fun fact: Once you’ve used your allotted three fast passes for the day, you can get on your phone app and search for more fast passes. You can keep getting one more fast pass at a time all day. We have used this a lot when the ride we were expecting to need a fast pass for was miraculously low wait time, we just went the regular line and used the fast pass on something else! Tip 3: Use your phone app to the fullest! The Disney World app gives you wait times, maps, updates on show times, let’s you order your food ahead of time (at participating restaurants) and let’s you book fast passes. Don’t go into the park without downloading it. You will log into your account and see your specific itinerary for the day. It is a super useful tool, so use it. Tip 3: Plan your route. This tip is hard to do if you have never been there before, so I will tell you what my family does. When you first walk into the Magic Kingdom you are on “Main Street USA”. It is super cute, but don’t get distracted… you can look at the shops and merchandise later for Pete’s sake! Walk to the end of Main Street, you will see Cinderella’s Castle. Gorgeous! Okay fine, stop and take a photo… but then keep walking. To your left you will see “Adventureland” written on an arch. Walk through the arch and you are in… you guessed it “Adventureland”! Adventureland has some cute rides, and since you got there when the park opened, you can check them out! My kids love Aladdin’s carpet ride, which is just your typical fair ride, but with a Genie twist. You also pass the Swiss Family Robinson tree house. It is neat to see, and it doesn’t take long to walk through… use your best judgement lol. The Jungle Cruise is also in this area. However, my favorite in this section is Pirates of the Caribbean so we do this next. After this, if you just keep walking around the back side of the park, you run into Frontierland. This is where Splash Mountain and Big Thunder Mountain Railroad are. Depending on if you chose these for a fast pass or not, I’d do those rides next. These lines fill up fast!! After this, keep walking around (this park is a giant circle, you can’t really mess this up). Stop off at the Haunted Mansion. Even if you have small children, you can still enjoy this ride. It is not that scary, more of a fun ghostly ride than a horror ride. Trust your own judgement though… I always take my kids, and they weren’t scared. Next up is Fantasy land. Now, if you have tiny kids, this may be where you spend the majority of your time. The princesses are here, Little Mermaid Ride, the dreaded… I mean well-loved “It’s a small world”, Peter Pan and Tea-cups and more… all there. So get to stepping, the day is only going to get more crowded. This is a good time to use your fast passes and to keep booking more fast passes. Also, the little mermaid ride line moves surprisingly fast. Nice surprise! However, meeting the little mermaid, not so much. You can do some of your own research before you go and pick out some things you really think everyone will enjoy. For ideas, see my other posts. Lastly, finish up your day in Futureland. There are some cool things to do there, but nothing (in my opinion) worth racing to at the start of the day. Don’t forget to look at your map on your app 😉 before you get there to kind of get adjusted to the layout. Once you got that, you’ll look like a Disney Pro. Tip 4: This isn’t a race but it sort of is. Now, don’t get me wrong. You need to utilize your time efficiently, but don’t take all the fun out of it. If you walk by the Magic Carpets and Jasmine just happens to come out for pictures, stop and get a picture. It will be okay. Just don’t leisurely look through all the T-shirt’s for your sisters kid’s birthday three months from now. Come up with a plan and stick with it. Tip 5: There’s always tomorrow. If you don’t get to it all on the first day then… welcome to the club. It is near impossible to tote around all the kids and the husband (ha, you know 😉) and see everything in one day. It is too big and they are too tired, hot, itchy, hungry, thirsty, sleepy… well you get it. So do what you can and save some fun for another day. We usually break up the Magic Kingdom into two days actually anyway. There is so much to do, it’s easy to make two shorter days than one really long day, especially with little ones. So just come back and pick up where you left off. Tip 6: “Food and Stuff” Even when you pack snacks and swear up and down you’re going to eat back at the room, you may end up making a liar of yourself. If this is you (like it is me) then here is my choice on lunch restaurant. We love the “Be Our Guest” restaurant. For one, the food is delicious. I’m not even joking, so good. And two, it is super convenient. It’s located in Fantasyland (and like I said earlier, you’ll probably spend a lot of time there anyway) and if you follow my path you’ll be there around lunchtime! You can also order your food a couple weeks in advance so that when you show up, within minutes your food arrives! How sweet is that?! Plus, the atmosphere is really nice. Don’t expect to see the characters however unless you eat there for dinner. So, if you plan on eating lunch there one day, check it out. Make sure to make reservations for this restaurant 6 months in advance because it books up fast! Tip 7: Be a kid. You can’t take away those wrinkles or gray hairs (well with the right hair stylist and facial products, you can.. but I digress) but at the Magic Kingdom, act like a kid. Enjoy the shows, take in the details, wear the Minnie Ears… let the Magic really sink in. You will enjoy it and so will your kids. They need to see you let loose from time to time. Jump in and have fun with them! Next Next post: When is the perfect time to take your kids to Disney?